Now that you have visitors checking out your new website, how do you get them to convert into customers? By landing pages. What are landing pages? A landing page is a web page that allows you to capture a visitor’s information through a lead-capture form, basically a conversion form; it’s like a welcome mat. 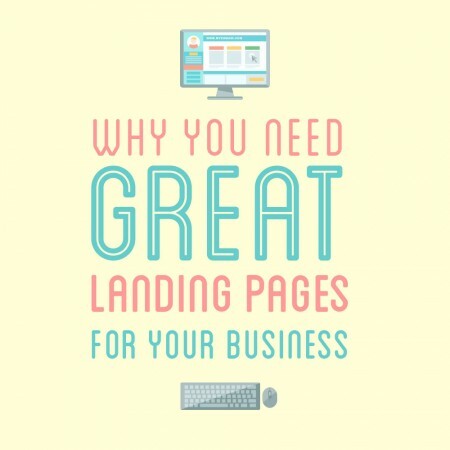 A great landing page will catch a potential customer’s eyes and convince them to fill out their information and now they are a viable lead for your business. Easily generate leads: Landing pages improve conversion rates and is an easy way to collect important information from potential customers. Leads are potential sales contacts. Narrows your focus and removes the clutter: Your home page is not a landing page! You will need something that will catch a user’s attention quickly and allow them to understand your brand quickly. Using landing pages is all about maximizing your return on investment for each customer. The more specific, simple and streamlined a page is, the more likely the user will take the desired action. Not only that, it makes it clear to visitors what your website or services are about. This great landing page is clean and very appealing. Visitors can clearly distinguish where to put their information and what this business is about. 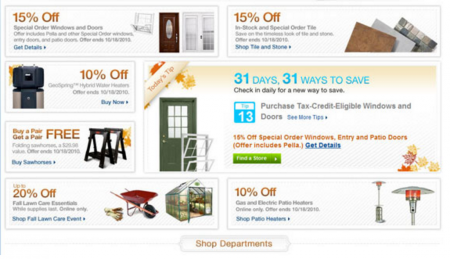 This is one of Lowe’s landing pages and it so so cluttered that it overwhelms visitors. Where would visitors even click first on this page? Unlike most other marketing strategies, landing pages should be as simple as possible. Landing pages are merely there to catch one’s attention and be very easy for visitors to fill out. Good landing pages will lead to increasing conversions; for example, Dell has over 1,000 different landing pages to target specific audiences and the company has seen increases as much as 300% when testing landing pages against homepages. You can clearly see the landing page on the right side where it asks for basic information. It is very clear and simple to fill out which will draw in more potential customers. 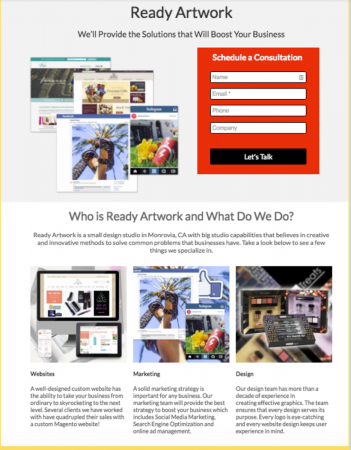 The landing page also makes it very clear that our services include website design, social media marketing, and graphic design. Everything is very streamlined and concise for the visitor’s benefit. However, Getting landing pages built and tested is one of the top five challenges faced by B2B marketers and Ready Artwork understands how important landing pages are for your business and we can tailor one according to your audience and your needs! Contact us or give us a call at (626) 400-4511 to learn more!